The new "Jacket Size" MD Walkman from Sony comes in 3 different colours; Black, Silver and Blue. From my point of view the one in silver is the beauty of them all. The unit stands out as slick as the MZ-R55 and the MZ-R90, but it is thicker due to the bulge for the AA battery. There is no attachable battery pack with the unit, and no expensive rechargeable battery. You can use a standard AA battery, or the rechargeable AA battery that is included. The design is brand new. The display is long - like the display on the remote for MZ-R55 and MZ-R90. The buttons are easy to use, and are placed logically. The menu system is also easy to use, and you quickly get into the functions of the unit. 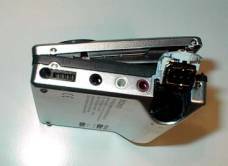 The combined jack for the remote and headphone is located on the right side of the unit, an additional headphone jack as well as the line in (analogue and optical) and microphone input jacks are located along side it. The small 3VDC input jack is found on the front side of the unit. The remote is plastic and has no display, but it is very easy to use and includes editing capabilities. You can label the tracks and discs, change the track sequence, etc., with the Remote. 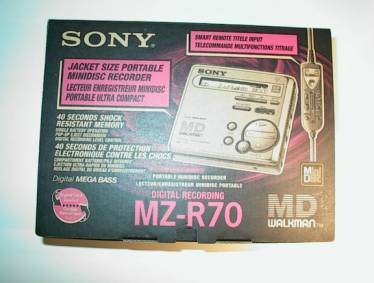 It has a simultaneous labeling feature, so no more waiting for the recording to end; you can label tracks and discs while the MD is being recorded or played. 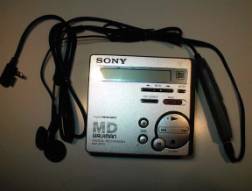 It has a simple "Pop-Up Eject" function for easy MiniDisc handling. 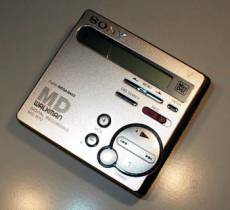 A single press of a button on the side of the recorder causes the lid to open and the MiniDisc to eject. It has the same shock-resistant memory capacity as the MZ-R55 and MZ-R90, offsetting up to 40 seconds of optical read errors. Its digital recording level control allows manual adjustment of recording level even when recording from digital sources. An AC adapter power supply and an optical cable with TOSlink and miniplug connectors are included with the unit. A minor drawback on this great product from Sony is that when the unit is re-positioning the read/write-head during playback (usually about 10 sec. out of every 60 sec.) it emits a distinct mechanical noise that is audible at a distance of 1 meter or so, when running on battery. 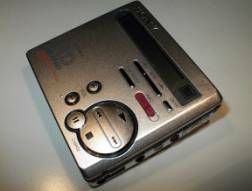 While recording, running on battery, the unit emits a sizzling noise. During recording and playback the unit emits the same distinct mechanical noise constantly, when connected to the power supply. Bear this in mind, especially when recording from a microphone!